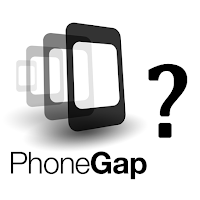 Kasen's Blog: Is PhoneGap the right choice for X project? Is PhoneGap the right choice for X project? Small learning curve for web developers since it uses known technologies such as HTML5/CSS/JS. The PhoneGap API offers a event model that is familiar to client side developers. It’s easier to find web developers than native iOS developers. Reusability: If the app is structured in modules, this could be potentially reused for a web app that shares common functionality. Options: There are a plethora of different frameworks and libraries in the web that can be used to fulfill different needs in each app. For example: jQuery Mobile, Sencha Touch, JQ Touch, iScroll, SpineJS, just to mention a few. WebKit: since both iOS and Android platforms rely on Webkit for their browsers, PhoneGap apps can use some of the latest HTML5 and CSS3 awesomeness. Support for web version of Google Analytics. Conditional code for each platform. Scrolling for iOS might have glitches handling large views. For large apps using a JS MVC framework is encouraged. SpineJS is a good option that includes also a flexible template engine. CSS Media Queries can be used to handle the resolutions and orientation across devices. For example, this technique can be used to load higher resolution images for bigger screens. Need to deploy in several platforms. Simple apps with reduced budget or human resources for the project. The hierarchy of views is not more than 5 levels deep. Does not need to handle large images or too many of them in a single view. This blog is having a wonderful talk. The technology are discussed and provide a great knowledge toall. This helps to learn more details about technology. All this details are important for this technology. Thank you for this blog.